Home › Blogs › In the Tack with the Pak › Fall in love with boots, boots, and more boots!! Fall in love with boots, boots, and more boots!! As we horse people of course know, equestrian is always in style! Here at SmartPak we have many, many true equestrian boots to fit any of your needs. From going out on the town to getting dirty in the barn, we’ve got you covered! And with free shipping on orders over $75 and free returns on sized items, you’re sure to find something that is just right! 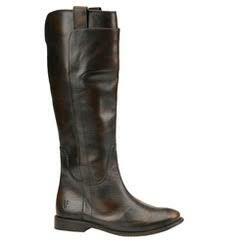 The Cordoba Boot is a beautifully hand styled two-tone brown calfskin leather boot. The heavy duty full-length zipper has a long leather fringe pull and single buckle closure for a unique and stylish look. Scalloped leather and intricate eyelets add to the character of these stunning boots. 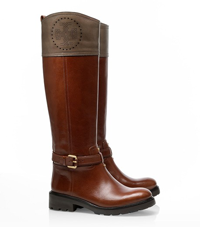 The Dubarry Longford Boot is the pinnacle of Dubarry’s iconic elegance, durability, and versatility. These stylish boots are waterproof and have double buckle detail combined with side panel beading that add a sophisticated look to this functional boot. Weathered leather and suede exterior is lined with plush faux fur. With three ways to rock the look, it’s like three boots in one! Wear it with the cuff flipped up for knee-high coverage, with the cuff rolled down for aprés-ski style or with the shaft scrunched down for a mid-calf “slouch” look. Comfortable enough to wear all day, but not intended for riding. In fun colors, the Justin Women’s AQHA Ostrich Remuda Boot features a long base block heel, wide square toe, and double-stitched welt. The J-Flex Flexible Comfort System® Insole is so comfortable; it will feel as though this boot was made just for you. Fashion, comfort, performance – the Solstice Waterproof Leather Boot has it all! These incredibly versatile crossover boots are just as perfect for barn chores as they are around town as a fashionable, functional footwear choice across the seasons. And they’re affordable to boot! Style, comfort, warmth, and practicality combine in the Dublin Turndown Boot! Now you can keep your feet warm and dry wherever you go without sacrificing style! 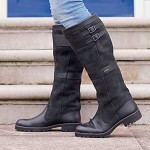 These boots are both waterproof and fleece lined for extra comfort throughout the seasons. 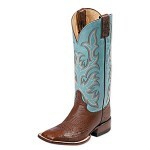 A flat-out favorite the Ariat Women’s Fatbaby Saddle Boot is for cowgirls who get the job done. Fatbaby style adds some distinctive fun with its wing tip detailing and sweetheart stitch pattern. Winter riding just got warmer with Ariat’s new Brossard Collection. The gently rounded toe styling accommodates a more generous fit and has added updates in the gusseted tongue, waterproof full grain leather with suede and neoprene uppers. The Solstice All Terrain Waterproof Winter Boot keeps you warm and ready for whatever winter sends your way! With its streamlined construction, unbeatable insulation, and durable tread, you’ll wonder how you ever lived without this utilitarian winter boot! 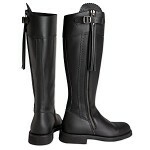 The Bogs Herringbone Tall Boots provide a sleek, classic equestrian look with a sneaker-like fit. These comfortable, durable, and stylish boots will be your go-to boot at the barn or even in your own yard – you’ll wonder how you ever lived without them! The best mucking boot around! 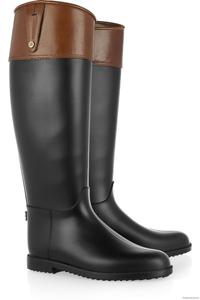 Keep your feet, ankles, and lower leg warm, dry, and clean with the Tack Classic Boot™. The Tack Classic Boot™ slips easily on while the stretch fit topline binding snugs comfortably to your calf, sealing warmth in and cold out! This Pajar Ice Gripper Boot provides premium warmth and waterproof protection with the ultimate grip to give you sure footing in winter’s worst conditions. Pajar patented swivel hinged ice gripper on the bottom of the boot that can be flipped over for the ultimate traction on ice and snow.